PORTLAND - Robert Arthur Brown, 89, passed away peacefully on Jan. 26, 2019, in the company of his extended family and friends at Maine Medical Center in Portland, Maine. 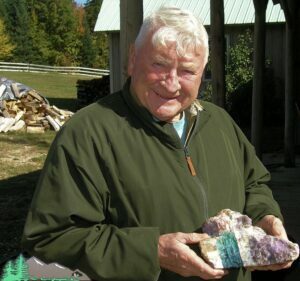 PORTLAND – Robert Arthur Brown, 89, passed away peacefully on Jan. 26, 2019, in the company of his extended family and friends at Maine Medical Center in Portland, Maine. Robert was born in Hanover, Maine on July 31, 1929, the second son of Ira A.Brown and Miriam Cole Brown. Robert attended schools in Hanover, Maine. He served in the U.S. Army for two years during the Korean War. He began his lifelong career in timber harvesting and land management as a young man of 16 years. He incorporated both traditional logging practices using horses as his partners as well as modern machinery. His love for the forests and mountains of Hanover and Newry was rooted deep in his soul. His Plumbago Mountain Farm was the gateway to the famous Newry Quarries Complex; a special place that he was able to acquire and where he conducted exploratory mining for many years. Robert Brown was a self-made man – witty and talented and lived each day on his own terms. His absence on Howard Pond will surely be noted. Robert was predeceased by his brother, Richard; his sister, Louise Worcester; and sister, Elizabeth Hayden. He is survived by his brother, Stanley Brown, who brought joy to him his whole life. The family would like to thank the wonderful team of doctors and nurses at Maine Medical Center who cared for Robert. We extend special thanks to Dr. David Ciraulo, D.O. for his persistent expert medical oversight; and for the Ciraulo family who have shown Mr. Brown unwavering kindness. Services will be held in May at the Hanover Cemetery in Hanover, Maine. Arrangements entrusted to Hobbs Funeral Home, South Portland, Maine. Online condolences may be expressed at www.hobbsfuneralhome.com.